Neil Hayward | Birder. Author. Croissant Eater. 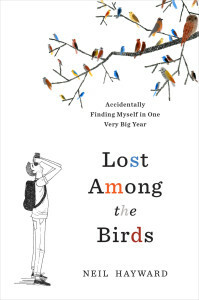 Lost Among the Birds is out today (June 7th)! It’s available in bookstores and online. This week, I opened a box from my publisher, Bloomsbury. The box was full of copies of my new book. 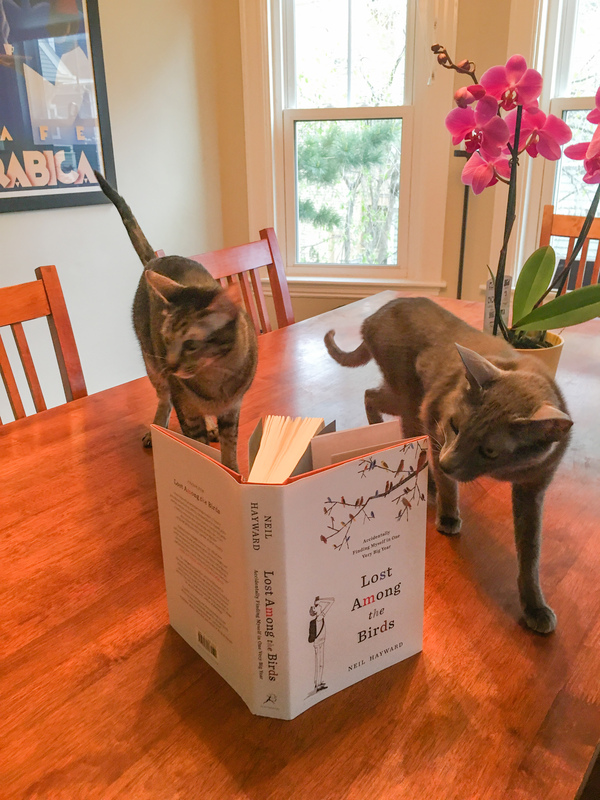 They’ve just finished their first print run. The book looks beautiful although I’m probably a little biased! I buy books all the time – from bookstores, used bookstores, and online. I haven’t made the transition to the electronic world yet (and don’t suppose I ever will) so I’ll be stuck with books and the constant searching for shelf space that comes with their ownership. I’m always excited to get a new book, but that’s nothing compared to the excitement of seeing your own name on one. If you’re not a parent (which I’m not, yet) then this is probably as close as you get to bringing a new life form into the world. Hopefully this one won’t be an obnoxious brat, and people will like it. It’s been an adventure to get to this point, and a considerably longer one than the Big Year about which was is written. It’s been as frustrating, difficult and rewarding as the Big Year, and I’m happy that the all the work is finally over and I get to share it soon. The publication date is: Tuesday, June 7th and it’s available for pre-order now on Amazon, etc. I’m excited to announce that I’ll be speaking at the British Birdwatching Fair on August 19, 2016. The fair last three days, it’s the largest of its type in the world (it’s billed as the Birdwatcher’s Glastonbury) with over 20,000 attendees, and has been running for almost 30 years. I haven’t been to Rutland Water, where the event is held, for at least 25 years. 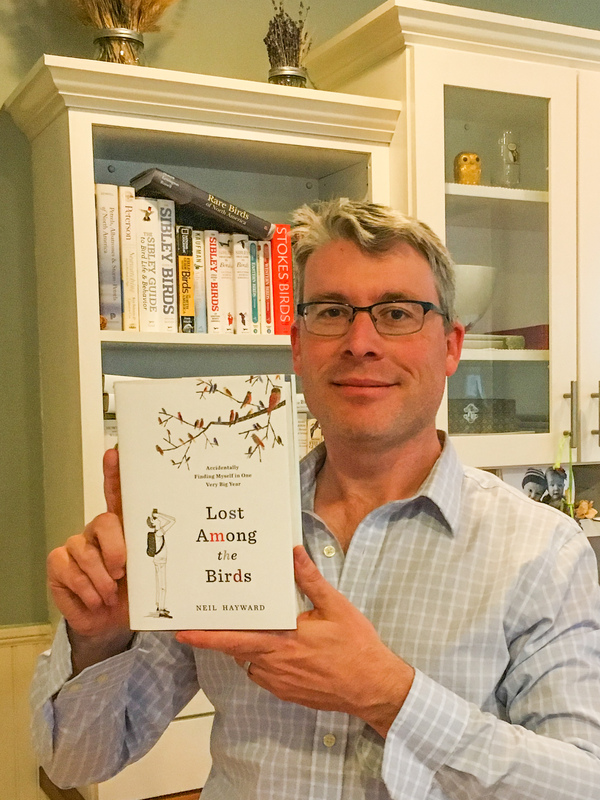 And I can’t even remember which bird it was that I chased up there, leaving high school on the stroke of the bell, hoping to beat the rush hour, the setting sun, and the prospect of whatever feathered thing it was from a premature departure. I rarely get the chance to visit the UK now, and it’s mostly to see friends and family, that I don’t get nearly enough time to enjoy the birds. It’s no longer the rarities I miss, but the common ones, the ones that now feel like childhood friends. There’ll be a lot to do and see at the fair, but I hope I’ll get the chance to slip away and reconnect. If you’re going to the fair then I look forward to seeing you there! Audible have just started production on an audiobook version of Lost Among the Books. Apparently, the production process can take up to 3 months, so it probably won’t make it for the book release, but for those who prefer listening to their books, it shouldn’t be too long of a wait. I’m excited to hear the end result. Will they have bird sound effects? 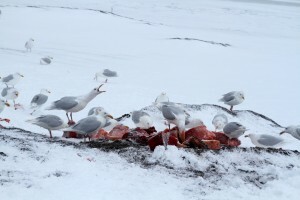 How will they recreate the sound of hungry Glaucous Gulls feeding on frozen whale blubber, will they cut the swearing from the deer tick attack, and how much will they have to pay Brad Pitt for the recording? Nom nom nom. 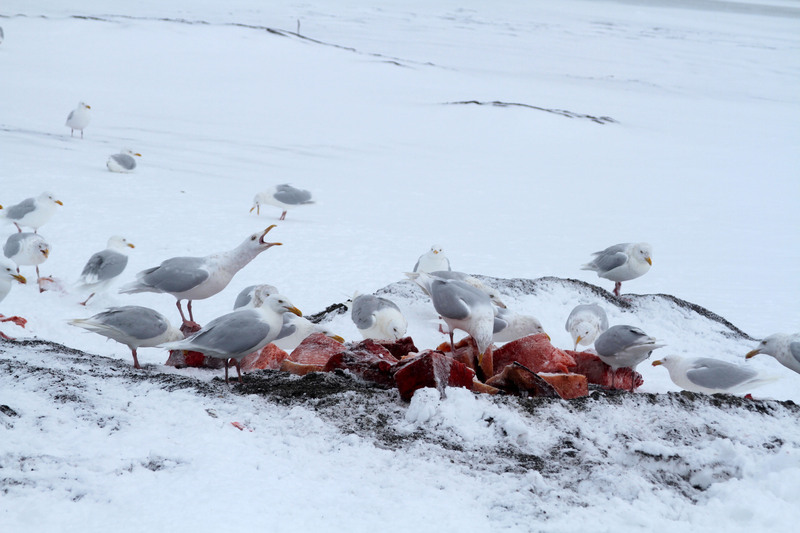 Glaucous Gulls feeding on whale. The clue is in the name: if you want to see a Cuban Vireo (and why wouldn’t you?) you need to go to Cuba. It’s the only place in the world where you can see this small, slightly plump bird with a hooked-bill. 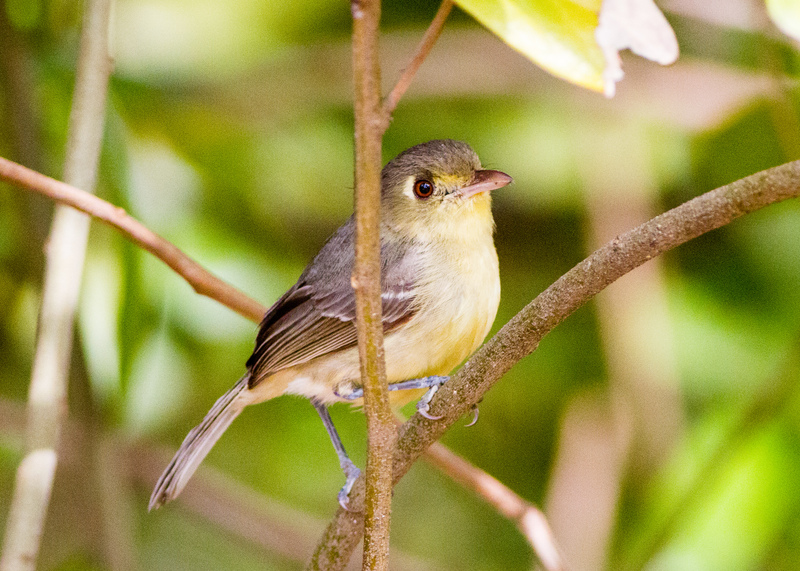 At least, that was true until this week, when a Cuban Vireo was found for the first time in a place that isn’t Cuba. One was singing loudly from a small grove of trees in Fort Zachary Taylor Park, Key West, Florida. 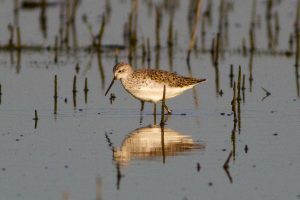 I was in California at the time, watching a rare Marsh Sandpiper (only the 3rd record outside of Alaska), when the news broke. 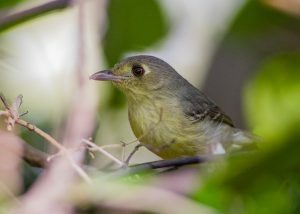 I was standing with a small crowd of birders who were suddenly wondering just what a Cuban Vireo was, why it was in Key West, and, more urgently, how soon could they get there. For me, the answer to that last question would be the following day. 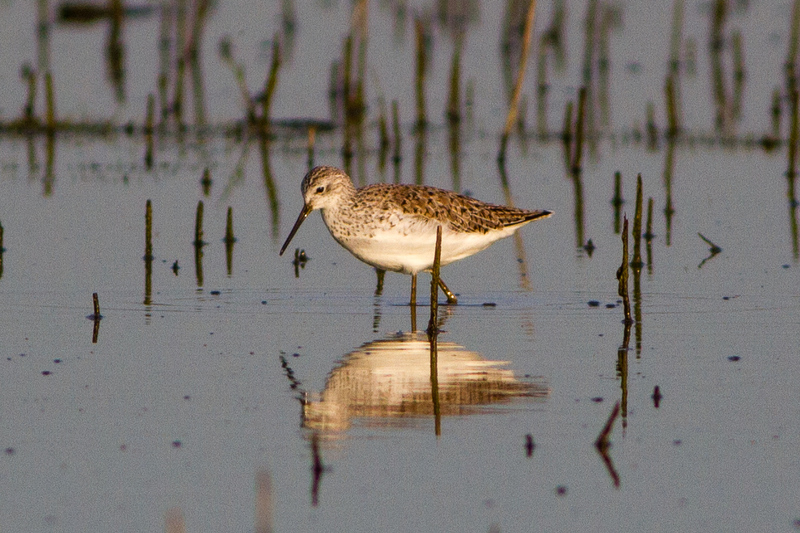 Marsh Sandpiper – photo taken shortly before this bird became the second-most exciting bird in the country. I arrived at Fort Zachary Taylor Park around lunchtime. It was the first time I’d ever flown to Key West, and I certainly appreciated not having to navigate the tediousness that is the Overseas Highway. 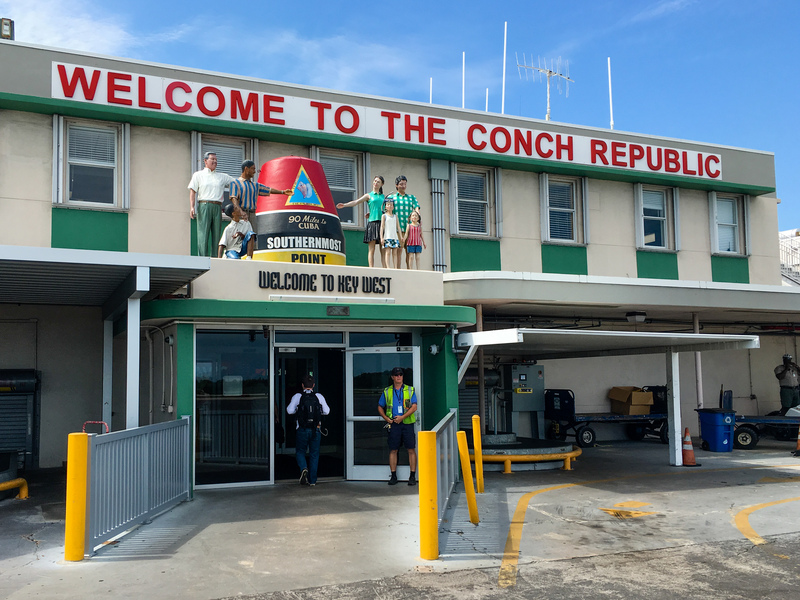 It’s the only road into Key West, a 113-mile long string that connects the coral keys like beads on a string. It’s also seemingly the only road in the country where the posted speed limits are a suggestion only in cases of extreme emergency. For the rest of the time, it’s ok to drive slow enough to spot jellyfish out the window, change into and out of your bathing suits, all while happily ignoring the caravan of fuming drivers behind. There’s a special allure around ABA firsts – birds that have never before been recorded in our collective backyard, and whose portraits haven’t been represented in our field guides. They’re the rarest of the rarities. And since they’ve never been recorded before, who knows if they ever will again. For many, you only get one shot. The grove of trees measured only 50 feet by 20 feet, but it was dense enough to hide birds. 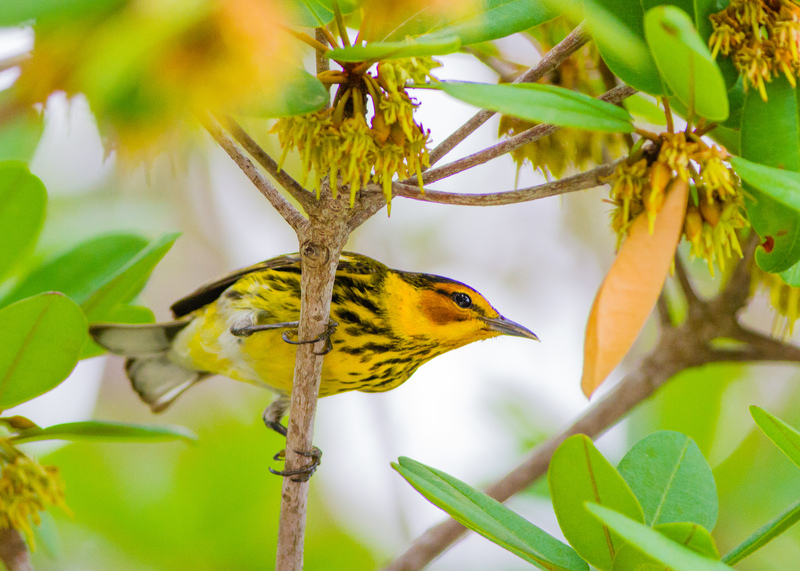 If you stuck your head into an opening, and pulled the branches aside like coats in a closet, you could make out the furtive movements within – a Cape May Warbler here, Blackpoll Warbler there, and a heart-stopping Worm-eating Warbler. The movements were equally furtive on the outside –bird watchers, cranking their necks, peeking into the darkness. Like the warblers they were migrants too. At least that’s how Laura transliterated the whistling call emanating from deep within the grove. Neither of us had heard it before, except as an mp3 file in our quick research that morning. It called twice, which was enough to know this was our bird and enough to pull the heads of the assembled birders into the leafy curtain of branches. One by one the assembled birders released sighs of relief, happy their travel bets had paid off. But I was still searching for movement: I didn’t have the bird. 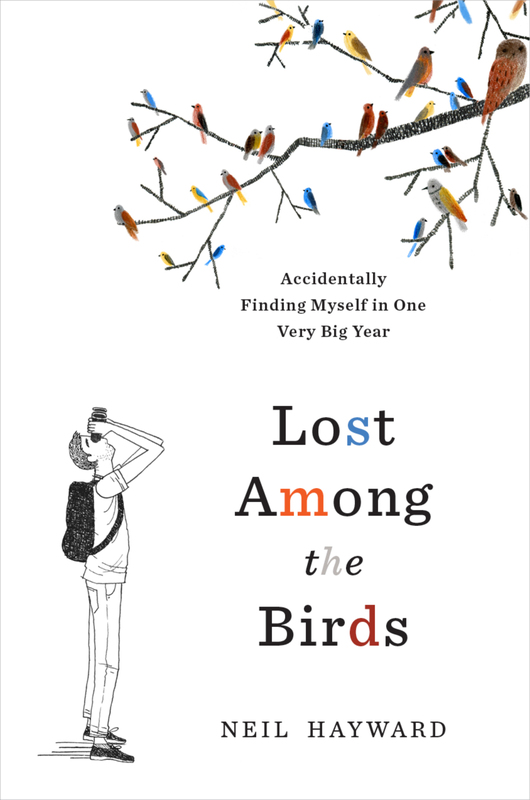 Birding tests your faith in your own sensory abilities. You never know whether this will be the only chance you get, you don’t know whether you should stand still and wait, or try to move next to someone who has the bird. And you’ll never know the right strategy until it’s too late. But what you absolutely do know is that you mustn’t panic. I moved to the right, crouching down to peer higher into the rubbery leaves of a sea grape tree. The other noises – the cars entering and leaving the park (on the road right behind me), the mutual congratulations among the birders, and the excited shouts from a nearby and hidden beach, had stopped, as if the air pressure had suddenly dropped and I was in a vacuum. All I cared about was the bird. And when I saw it hop down onto a branch, wide-eyed with a large, horn-colored bill, the noises came back, like the explosion you get when you come to from fainting. Whenever I see a bird I’ve never seen before, that I only know from illustrations and written descriptions in field guides, there’s a period of calibration as I try to match the bird in front of me to the one I’d already created in my head. For this one, I hadn’t been too far off; my mental model needed a bit more plumpiness to the belly, the bill a shade or two paler and larger eyes. I mentally ticked off the other diagnostic marks: wing bars, creamy-yellow underparts, and a white tear-drop behind the eye, which accentuated the bug-eyedness of the bird. I’ve spent more time recently working on photographing birds. I’ve always been careful that it doesn’t replace the immediacy of the experience, stuck behind a lens worrying about aperture and ISOs, rather than just plain enjoying the bird. But I learn more through photography, as I can take the bird home with me, often seeing more than I could ever see in the field. But I’m still a birder first. I like to capture the image first with my eyes, committing it to memory, feeling that I’ve actually “seen” the bird. This time, by the time I switched to the camera, sated with my binocular views, the bird had moved back into the darkness. It played hide-and-seek for the next hour, giving views to close I could barely focus on it, and then completely disappearing back into the darkness. Although the Cuban Vireo was the raison d’etre of my trip, the highlight was probably a slow afternoon of watching hungry Cape May Warblers feeding around the park, resplendent in their new breeding plumage. It’s a bird I seldom see back home – they pass through so silently and quickly in spring that some years I miss them entirely. It was a real treat watching them at eye level, oblivious to the two photographers, Laura and I, who greedily collected their portraits. The Cuban Vireo stayed through the weekend, pleasing crowds of birders, before disappearing on Monday. Who knows where it went. I doubt it ran out of butterflies to eat, or caterpillars to pick off the sweaty trees. But, as a resident, non-migratory bird, lacking the long-range compass and maps that migrants need, it almost certainly didn’t make it back home to Cuba. Wherever it went it left behind many happy birders, and some frustrated ones who couldn’t make it to Key West in time, and made a little history: the bird made front page of The Key West Citizen newspaper. 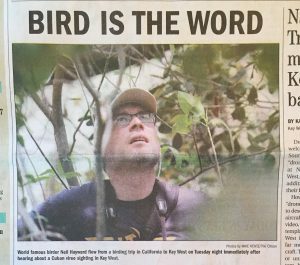 Actually, it had to share the front page with a much less elegant photo of me looking up at the bird and exposing an overly stubbly gorget. Front page of The Key West Citizen. 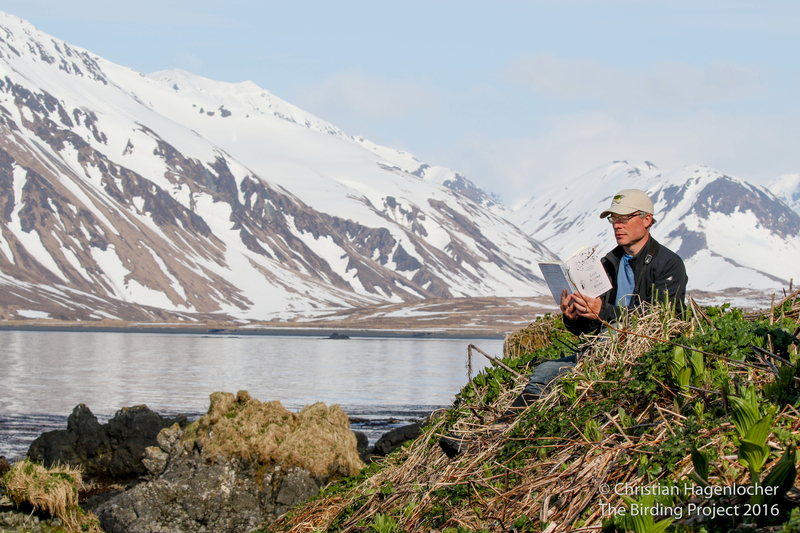 In 2013, Boston birder Neil Hayward traveled almost 250,000 miles by plane, car, boat, and kayak. As well as almost 10 feet vertically up a tree (where, you’ll be glad to hear, he successfully navigated his way back down). 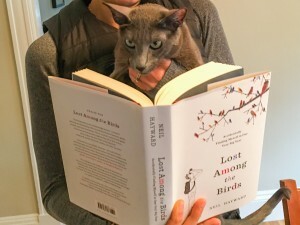 His quixotic quest: to see birds. His peregrinations took him to the corners of this vast continent: Barrow in the leaden, frozen north; the Dry Tortugas, dangling off the Florida Keys to the south; Newfoundland, poking out to the east; and tiny Adak, an island adrift in the volcanic Aleutian chain of the west. And a place they call New Jersey. By the year’s end, he’d netted some 749 species of bird and broken an historic record many thought was unbreakable.